Last years drama between Meek Mill & Drake put a unfortunate strain on the Canadian rappers relationship with Nicki Minaj. Today, the head Barb in charge shocked fans when she posted a photo of herself & Drake together & both looked quite happy to be in each other's presence. Another photo was also posted that included Lil' Wayne with the caption "#TheBig3 #YoungMoney". It was a huge Young Money reunion now that Minaj & Drizzy have obviously reconciled & are now back to being a loving duo. Now that Minaj is no longer in an intimate relationship with Meek Mill they are now able to get back to the place that bonded them in the beginning. 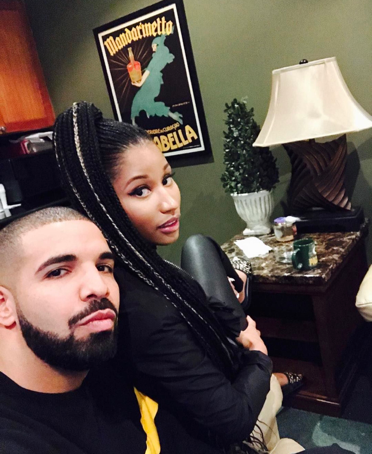 According to reports, Drizzy & Nicki reunited just a week after she parted way with the Philadelphia rapper. The last time they has spoken to one another was during the time of their 2014 collaboration for "Truffle Butter".